Currently, it seems common that a company store their business inventory in a powerful database. Because the company’s data files have not less amount of data and the amount is very much to care for, it is sometimes difficult to find a company their corporate data to determine accurately how many types of data generated. The understanding was finally analyzed by multiple vendors in finding an efficient solution to the utilization of managing your business to accurate point, Big Data. Big Data is not only mean something bigger. Not appropriate if interpreted as simply the volume of data or larger data sizes. Big Data is all about re-evaluating the potential of business data and trying to build an infrastructure that is able to take advantage of asset data within the enterprise as a whole. A solution that is able to find different patterns of relatedness between products, customers and suppliers that were previously unknown. In the year 2012, many vendors are gearing up in the Big Data explosion that caused significant impact on database management industry. McKinsey Global Institute also estimates that the volume of data will experience annual growth of 40% and will rise to 44-fold between 2009 and 2020. Traditional company data – including customer information from CRM systems, ERP transaction data, transaction web store (virtual store), data on the ledger. Data from Sensors / Machine – includes details of Data Calls (Call Detail Records, CDR), weblog, smart meter, sensor manufacturing, equipment logs (often interpreted as a digital exhaust), buying and selling the data collection system. Social data – including customer feedback streams, such as micro-blogging site Twitter, social media platforms like Facebook. Business growth in the future is definitely in need of a large database, but not only Petabyte-sized, the company must be prepared to be the emergence of data to Zetabyte. Therefore, it is important to have a company to meet future needs in an appropriate manner. One to think about is to have a comprehensive IT architecture for data center installations are qualified for data expansion in the future. Volume. Data generated by the engine where quantity is greater than the quantity of non-traditional data. For example, a jet engine capable of generating 10TB of data in 30 minutes. With more than 25,000 flights per day, the volume of daily data from one data source alone will be able to reach petabytes. Intelligent measuring tools and equipment in industries such as oil refineries and offshore oil drilling will be able to produce the same data volume, the increase above problems. Velocity. The data stream generated by social media – though not as much as the amount of data produced machines – produce large amounts of data relevant to the Customer Relationship Management (CRM). Even with only 140 characters per tweet, with the speed (frequency) of the user’s Twitter updates are quite high, the data collected must be very large (up to 8 TB per day). Variations. Traditional data formats tend to be relatively easy to define and change slowly. In contrast, non-traditional data format has a degree of change that is difficult to decipher. In line with the new service is added, the new sensor is installed, or a new marketing campaign that is run, the variety of new types of data needed to produce more relevant information. Value. Economic value of each data can differ significantly. Generally there is important information hidden in large data set of non-traditional; the challenge is how to identify which data is valuable for later processing and extracting data to be analyzed. As well as data warehouse, web stores and other IT platforms, a Big Data infrastructure also have special needs. By considering all these components of a Big Data platform, it is important to remember that the ultimate goal is to facilitate the consolidation of Big Data with a variety of data in a company that lets you perform an in-depth analysis of the overall mix of the original data is fragmented. Initial phase is one stage where there will be major changes to the infrastructure already existed before the Big Data. Because the Big Data refer to the flow of data at high speeds and a wider range of variation. Infrastructure needed to support the consolidation of Big Data must have low latency and predictable, both the time of measurement / data recording and when running short and simple queries; able to handle high transaction volumes, often in an environment of dispersed systems; and able to support flexibility dynamic data structures. In terms of data warehouse, data settings are called data integration. Due to the large volume of a Big Data, there is a tendency to manage a diverse collection of data on initial storage each, this is done to save time and money with no need to move large amounts of data. Infrastructure needed to organize the Big Data should be able to process and manipulate data from the initial storage location of each data. This means that should be required to have a large throughput capability (often needs to be run in parallel) to be able to process data in a number of very large, and capable of handling high data variations, ranging from structured data to unstructured data. Because the data is processed are not always united during the setting stage (organizing) the previous stage of analysis also needs to be done in a spread system, where some data will be stored at each location but still can be accessed transparently via a data warehouse. Infrastructure for Big Data analysis should be able to support the process of in-depth analysis such as statistical analysis and data mining for various types of data stored in a broader and different systems. The infrastructure must also be able to accommodate the increased volume of data to the extreme, providing faster response related to changes in the pattern (changes in behavior), and capable of performing automated decision-making based on analytical models. The most important point is that the infrastructure must be able to consolidate the combined analysis of Big Data and the traditional enterprise data. Generated new insights not only to analyze the new data, but also can be used to analyze the past data in order to get a new perspective on various issues ever faced before. For example, the analysis of stock data from an automatic vending machine combined with a schedule of important events which point the machine is placed, will be able to produce recommendations kinds of drinks whatever is most appropriate to be placed on certain days. 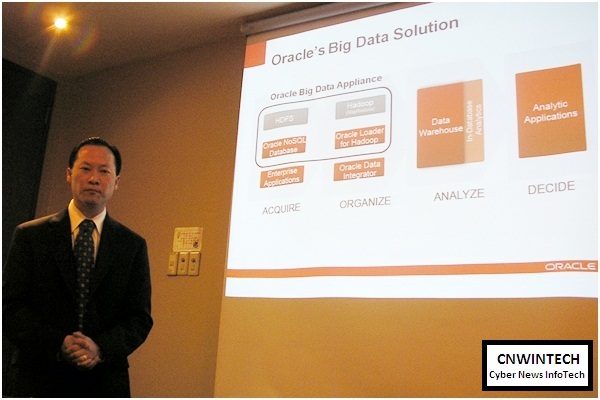 Oracle has designed and developed a comprehensive and an integrated solution to address a variety of purposes related to Big Data. Oracle’s strategy centered on the idea that a company can develop a data architecture that they have today so they can have the Big Data and the ability to deliver high business value, take advantage of durability, flexibility and proven performance of the Oracle system in responding to the needs of the management of their big data. Oracle has a high competence in combining all the parts needed to face the challenges that come with Big Data – including software and hardware – in one unified system. With the presence of Big Data Appliance Oracle recently introduced Oracle became the first vendor to present offers a complete and integrated solution to address a variety of purposes for Big Data management, delivering efficiencies, simplified management and open up new insights relevant to maximize business value. 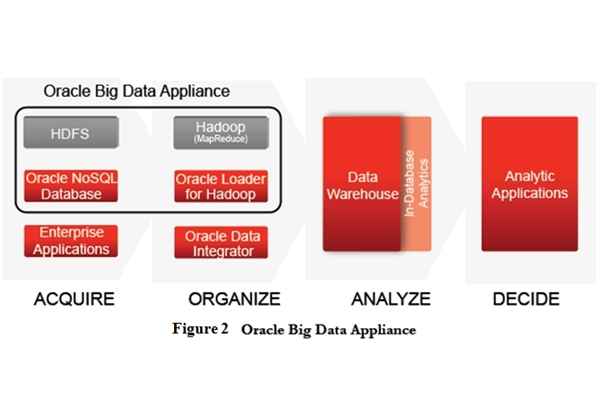 Designed to work together, Oracle Big Data Appliance can be easily integrated with Oracle Database 11g, Oracle Exadata Database Machine and Oracle Business Intelligence Machine Exalytics and designed to provide extreme analytics capabilities on all types of data, with the performance, availability and security of the scale enterprise.